Pocket probing around dental implants is an important diagnostic procedure for the assessment of peri-implant status and evaluation of periodontal therapy. 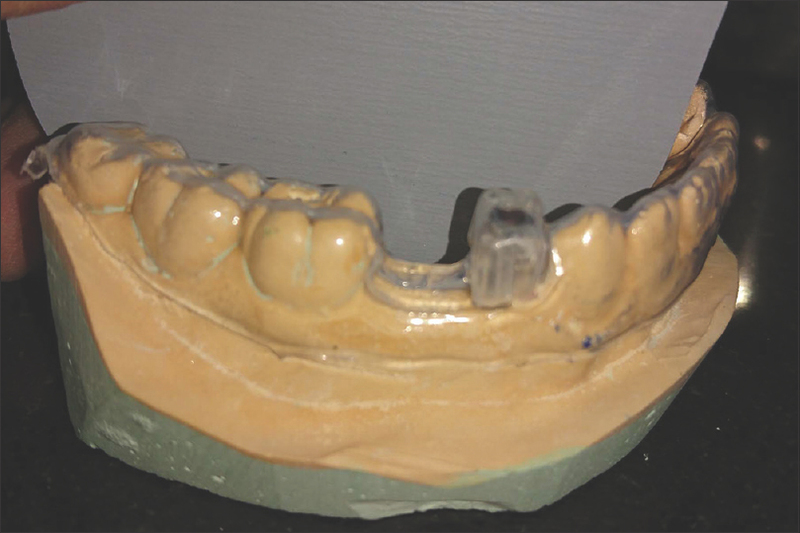 Conventionally, probing is done arbitrarily in the center of four aspects (mesial, distal, facial, and lingual/palatal) of implant without removal of the prosthesis. The prosthesis design leads to a steep convergence angle of probe insertion or possible penetration of peri-implant tissues which leads to incorrect measurement. 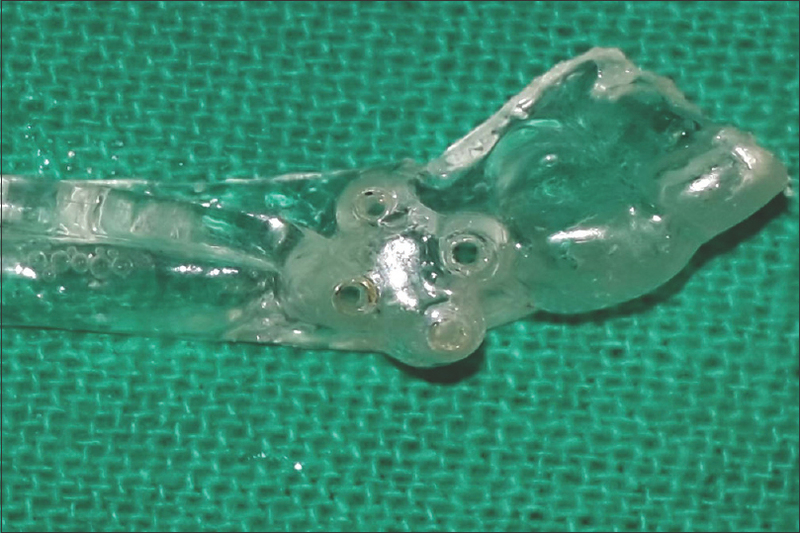 The present technique describes a vacuum formed polyvinyl chloride stent that allows peri-implant pocket depth measurements to be performed repeatedly and reproducibly at pre- and post-rehabilitative recall appointments. According to the American Academy of Dental Implantology, dental implant is defined as a cylindrical and/or tapered post, usually made of titanium that serves as a substitute for the tooth root and provides a strong and sturdy foundation for one or more replacement teeth. The most common condition resulting in implant failure is peri-implantitis, which is defined as a site-specific infectious disease that causes an inflammatory process in soft tissues, and bone loss around an osseointegrated implant in function. Increase in peri-implant (dental implant) pocket depth and bone loss are two important indicators for peri-implantitis. 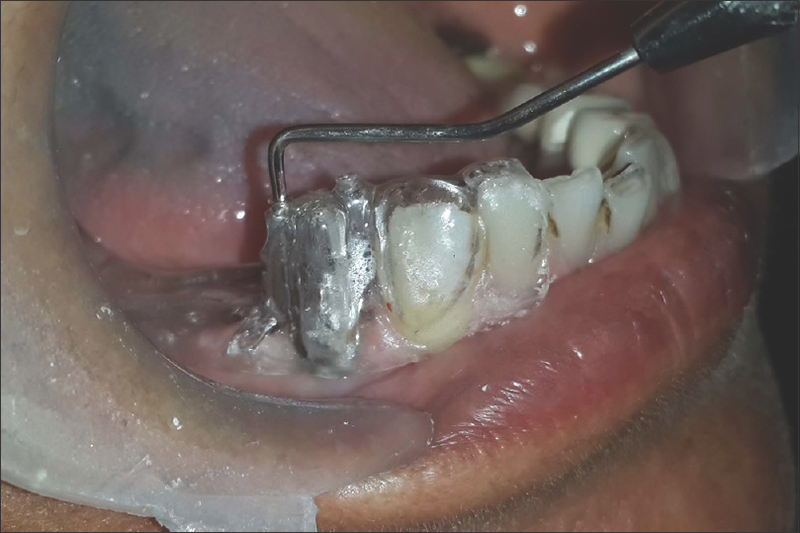 Regular clinical peri-implant evaluation is necessary for the detection of early signs of this disease and planning therapeutic interventions. Parameters routinely used to monitor oral implants during maintenance phase should be sensitive, easy to measure and yield reproducible data. Therefore, pocket probing is an important diagnostic procedure for the assessment of peri-implant status and evaluation of periodontal therapy. However, pocket depth measurement around dental implants differs from those around teeth. The difference in orientation of the supracrestal connective tissue fibers results in a more solid attachment around teeth, whereas around implants it is fragile. This means that the same amount of pressure in probing would lead to differences in measured pocket depth around implants and natural teeth. 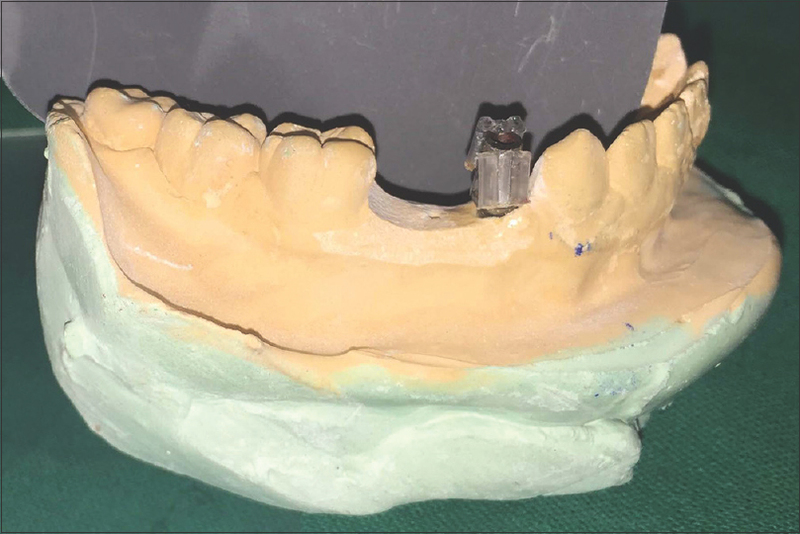 Clinically, probing around implants is influenced by a variety of factors, such as the sudden convergence created by difference in profile (shape) of the abutment/implant and prosthesis superstructure. Such factors have an effect on insertion angle of the probe, rendering it difficult if not impossible to probe different implant pocket depths at a constant/repeatable angle/force. Conventionally, probing is done arbitrarily in the center of four aspects (mesial, distal, facial, and lingual/palatal) of implant without removal of the prosthesis. The prosthesis design leads to a steep convergence angle of probe insertion or possible penetration of peri-implant tissues which leads to incorrect measurement of pocket depth. In the present technique, fabrication of a vacuum formed polyvinyl chloride (PVC) stent has been described to measure peri-implant pocket depth measurements repeatedly and reproducibly at pre- and post-rehabilitative recall appointments. During follow-up visits, prosthesis/superstructure has to be removed, and pocket depth is measured using the same stent all around implant abutment. This article describes a technique for the fabrication of a stent using vacuum-formed PVC sheet so that repeated peri-implant pocket depth measurements may be performed with high reproducibility and accurate comparison of pre- and post-operative measurements. It is advisable that before probing, prosthesis should be removed. Peri-implant probing should be done in reference to a fixed landmark on the implant or its suprastructure, thus bringing reproducibility and removing interexaminer bias. Four slots in the stent ensure precise angulation of insertion of periodontal probe that produces constancy in the measurement of probing depth at specific points. It has a simple design, is easy to fabricate in any dental laboratory and cost-effective. Drawbacks associated with arbitrary method are overcome with the use of the stent. This article details a simplified method for the fabrication of stent using PVC sheet for accurate and reproducible measurement of probing pocket depth around implants. Albrektsson T, Isidor F. Consensus report of session IV. In: Lang NP, Karring T, editors. Proceedings of the I st European Workshop on Periodontology 1993. London, Berlin: Quintessence Publishing Company; 2001. p. 365-9.
de Waal YC, Raghoebar GM, Meijer HJ, Winkel EG, van Winkelhoff AJ. Prognostic indicators for surgical peri-implantitis treatment. Clin Oral Implants Res 2016;27:1485-91. Salvi GE, Lang NP. Diagnostic parameters for monitoring peri-implant conditions. Int J Oral Maxillofac Implants 2004;19 (Suppl):116-27. Lang NP, Berglundh T; Working Group 4 of Seventh European Workshop on Periodontology. Periimplant diseases: Where are we now? – Consensus of the Seventh European Workshop on Periodontology. J Clin Periodontol 2011;38 Suppl 11:178-81.